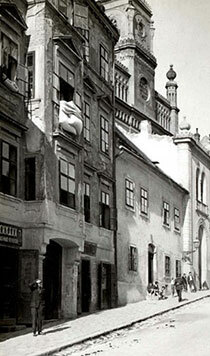 On the eve of the Holocaust the Jewish community in Bratislava was the largest Jewish community in Slovakia; it was a Jewish religious and political center, and home to the renowned Pressburg Yeshiva as well as the Zionist Organization of Slovakia. In 1930 some 15,000 Jews lived in the city, constituting some 12 percent of the population. Following the creation of an independent Slovak State in March 1939, the Jews of Bratislava were subjected to discriminatory practices and persecution. 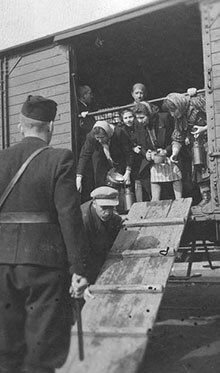 By the 1st of March 1942, nearly half of the city’s Jews had been evicted, and dispersed in smaller towns across the country. During 1942 many of the Jews of Bratislava were deported to the death camps in Poland. 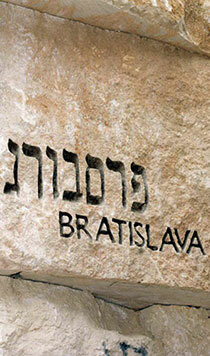 During the war the city was home to the Bratislava Working Group, which was devoted to rescuing Jews. The group’s efforts, however, came to naught and most Slovakian Jews were murdered in the Holocaust. 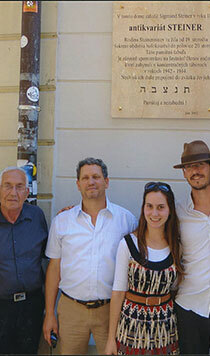 This is the story of the Jewish community of Bratislava. In German – Pressburg; in Hungarian – Pozsony. Bratislava, the capital of Slovakia, is situated in the southwest region of the country, on the banks of the Danube. The city became an important crossroads and trading center, thanks to its location on the Austro-Hungarian border. During the 13th century German merchants and artisans settled in the city, naming it Pressburg. Between 1536 and 1784 Bratislava was the capital of Hungary, at the time under Austrian rule. In 1818 a harbor was built, and several years later the city was connected to the railway system, consequently the level of economic activity in the city increased. Between 1867 and 1918 Bratislava (then Pressburg) was located within the borders of the Austro-Hungarian Empire. Following the First World War, the city became part of Czechoslovakia, and its name was changed to Bratislava. It retained its role as the financial, cultural and administrative center for the Slovakian region. Until the middle of the 19th century the majority of the city’s inhabitants were German. After the First World War Slovaks and Czechs became the majority, with significant German, Hungarian and Jewish minorities. In 1930 there were 137,000 Jews in Slovakia, amounting to 4.11 percent of the total Slovakian population. In October 1938 following the Munich Agreement, concluded in the same year, the Sudetenland was annexed by Nazi Germany and southern and eastern Slovakia were partitioned and handed over to Hungary; the remaining Slovakian territories became autonomous. Dr. Jozef Tiso, a Catholic priest, was appointed the state’s prime minister, and in March 1939 he declared Slovakia’s independence. In fact, Slovakia was a puppet state of the Germans from March 1939 until the end of the war, and the “Hlinka's Slovak People's Party”, headed by Tiso, established a one-party totalitarian regime. In 1939, with the creation of an independent Slovakia, Slovak territories were annexed to Hungary. In 1940 there were 88,951 Jews in Slovakia, out of 2,600,000 inhabitants.